The Winter Meeting Package, available between November 1, 2014 and May 1, 2015, plays to the strengths of this Toronto Airport conference hotel. For just $85 per guest, the package includes the meeting-room rental fee as well as complimentary high-speed Internet access and premium food-and-beverage offerings. TORONTO, ON--(Marketwired - Oct 30, 2014) - In most matters, good business practices involve due diligence. But when it comes to deciding where to hold the company meeting, the Toronto Airport Marriott Hotel eliminates the need for research. 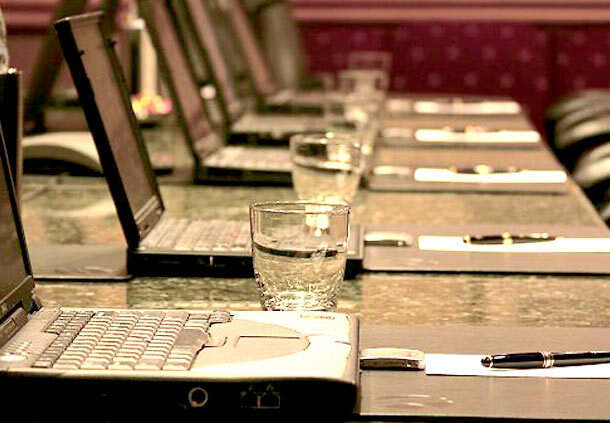 As part of its new Winter Meeting Package, this Pearson Airport hotel is offering the meeting room rental, Internet access, food and more at one highly competitive price. And that makes the job of meeting planners everywhere considerably easier. The Winter Meeting Package, available between November 1, 2014 and May 1, 2015, plays to the strengths of this Toronto Airport conference hotel. For just $85 per guest, the package includes the meeting-room rental fee as well as complimentary high-speed Internet access and premium food-and-beverage offerings. Groups enjoy other perks as well, like complimentary writing folders, pens and candy. One of the best features of the Winter Meeting Package, however, is its flexibility. With 20,000 square feet of event space, the hotel can accommodate groups of every size in its 21 conference rooms near the Toronto Airport. Meeting planners may choose a space that feels tailored to their needs, whether it's an intimate boardroom or the 1,000-person Grand Ballroom. No matter which space one books, however, state-of-the-art technology and A/V equipment, coupled with dedicated event planners, ensure productivity. Equally important to success is nourishment, and the Winter Meeting Package promises the best. Its continental breakfast, for example, fuels delegates with freshly sliced melon, berries, pineapple, yogurts, granola, croissants and muffins, as well as Starbucks coffee and juices. Delegates also enjoy a mid-morning coffee break, a working lunch buffet and an afternoon coffee break. The Winter Meeting Package isn't the only incentive for planners considering this YYZ luxury hotel, however. Through the end of the year, meeting planners who book qualifying events with 75+ cumulative nights will receive a complimentary iPad Mini. Not only is the device ideal for any busy planner looking to optimize efficiency, but it also enables event organizers to utilize the new Red Coat Direct app. This complimentary app connects meeting planners with hotel staff so that every request -- from thermostat changes to more coffee -- is made and resolved in real time for flawless meetings. And that spells success in any industry. Convenience and comfort come together at the Toronto Airport Marriott Hotel, where guests can enjoy the ease of being just minutes from Toronto Pearson International Airport without sacrificing comfort and style. Upon arrival, take advantage of the hotel's complimentary airport shuttle, perfect for late-night arrivals and early-morning departures. Settle into a spacious guest room, where thoughtful amenities include soundproof windows, luxurious bedding, a desk with an ergonomic chair, 36-inch LCD TV, coffee/tea service, 24-hour in-room dining and high-speed Internet access. Concierge-level accommodations offer an upgraded experience, with a separate living and sleeping area and additional amenities. This Toronto airport conference hotel caters to business and leisure travellers alike with a gym, indoor pool, whirlpool and solarium. Enjoy Canadian-inspired dishes and crafted cocktails in the lounge-like Bistro West by East, or explore dining options downtown, just 20 minutes away and home to attractions like the CN Tower, Royal Woodbine Golf Club, Rogers Centre and Canada's Wonderland amusement park. This Toronto airport hotel is a top choice among both meeting planners and wedding planners, and offers 20,000 square feet of event space. Follow us on Facebook to get the latest updates!